This treatment is comprehensive “results oriented” facial that produces improvement in the overall health of your skin. Good for all skin types and reduces the appearance of sun damage, fine lines, poor elasticity, enlarged pores, congestion, and acne. You will see an immediate improvement in the texture, clarity, and elasticity of your skin, which can be continually enhanced if you receive consecutive treatments. Includes face and shoulder massage and moisturizing hand treatment. Removes dead skin of epidermis and tightens and firms skin as well as making your skin smooth and look younger. Super fine organic grain for sensitive skin. Removes dead skin of epidermis and tightens and firms skin as well as making your skin smooth and look younger. *When combined with a facial, it includes a customized mask, neck and shoulder massage. This is the strongest peel with superfine salt. 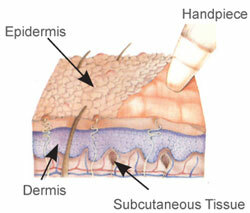 The top layer of dead skin is exfoliated with super-fine salt and air pressure; the result is radiant and smooth skin. This procedure will smooth out wrinkles and eliminate spots on the skin. Face and shoulder massage, hand treatment and face mask are included.